He also said that Ireland is the most likely country to get back to the markets due to the “extraordinary patience and hard work” of its people over the last five years. THE GOVERNMENT HAD undertaken “substantial contingency planning” on the IBRC liquidation bill before yesterday, the Minister of State for Finance said today. 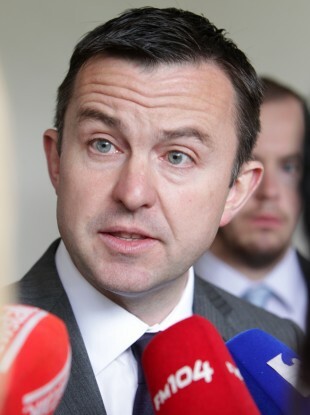 Junior Minister Brian Hayes spoke to RTÉ’s Morning Ireland this morning, when he said that the Minister for Finance said last night that he would have preferred to “do this another way” but when the leak emerged yesterday afternoon, it had to act quickly. absolutely prudent and right – if you are going to liquidate you don’t do it with notice to people; you do it with the clear legal guarantees that you can do it so that we can protect the substantial assets that are there within the IBRC. Hayes said that there has been substantial contingency planning by the Department of Finance and by the government “for quite some time”. He also said that the late-night meeting “wasn’t analogous to the night of the [banking] guarantee or anything close to that”. “We have been working on this for a very long time,” he said. We will wait and see what comes out of Frankfurt today. But as far as we are concerned the prudent, the right thing to do was to safeguard the assets that were there in the IBRC. According to Hayes, the European Central Bank “have no fundamental disagreement to the action that was taken last night by the Irish Government in so far as we were protecting what was rightfully ours”. He said the government will continue to negotiate with the ECB and are “confident and optimistic” that they can get the best deal for Ireland. We are ambitious for a larger deal in terms of breaking the link between the banking and the sovereign debt – that is something that will continue. With regard to IBRC staff, Hayes said that they have skills in dealing with legacy assets and legacy debt. He believes a number of staff will be offered positions in that context now that the debt will transfer to NAMA. Hayes said the government is “very confident about the constitutionality and legal robustness of the legislation”. The Quinn family case will continue, he said, as the government “is determined to follow the money trail”. According to Hayes, there is goodwill towards Ireland across the EU, and “people know the most likely country to get back to the markets away from the Troika is Ireland, because of the extraordinary patience and hard work of our people over the last five years”. Email “Hayes: "Substantial contingency planning" by government on IBRC ”. Feedback on “Hayes: "Substantial contingency planning" by government on IBRC ”.